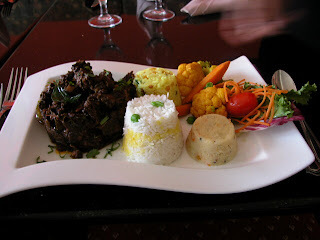 Indique is a gem of an Indian restaurant in Washington DC's Clevelend Park. It's name comes from the combination of Indian and Unique and seems to be an apt title for a place that thrives on creating new variations on traditional indian food. Two hours after my first bite, my mouth still tingles from the deep heat of toasted telecherry peppercorns in the signature Chicken Chettinad- the best indian that I've had since years ago on London's Brick Lane. Sides of cucumber raita( with hints of cumin swimming in fresh yogurt)mango chuutney and naan and icy cold KingFisher beer rounded out the meal.